July 11, 2018 (EcoSophia.net) -- This week we continue a monthly discussion of The Cosmic Doctrine by Dion Fortune, which I consider the most important work of 20th-century occult philosophy. Climb in and fasten your belts; it’s turning out to be as wild a ride as I expected. As noted in earlier posts here, there are two widely available editions of The Cosmic Doctrine, the revised edition first published in 1956 and the Millennium Edition first published in 1995, which reprints the original privately printed edition of 1949. You can use either one for the discussions that follow. The text varies somewhat between the two editions, but the concepts and images are the same, and I’ll be referring to both. Revised Edition: Chapter 2, “The Forces of (Negative) Evil,” p. 14-17. Millennium Edition: Chapter 1, “The First Manifestation,” from the first complete paragraph on p. 22 through the end of the chapter on p. 25. The responses to last month’s post, the first in this sequence, were very heartening to me; a lot of people are clearly up to putting ample study and thought into this important occult text. Thank you all for taking this seriously! With that, let’s go on to the next set of ideas and images. We pick up where we left off, with the Ring-Cosmos spinning in one plane, the Ring-Chaos spinning just outside it in a plane at right angles to the first, and the Ring-Pass-Not marking the boundary between them. 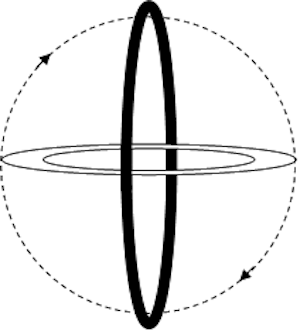 In the diagram, the Ring-Cosmos is the light-colored ring, the Ring-Chaos the dark-colored ring, and the Ring-Pass-Not the dotted circle. When you imagine the three rings for the purposes of this chapter, it’s helpful to keep them in this orientation, with each of them at right angles to the other two. Yes, I know that the Ring-Cosmos pivots around as shown by the little arrows, but symbolically speaking -- and these are symbols, remember, meant to train the mind rather than to inform it -- the rings should be imagined at right angles to one another. Much of the discussion in this chapter will make more sense if that’s kept in mind. The two versions of our text differ here in detail, but the basic concepts are the same in both cases. The first thing to work on, as you think your way through this chapter, is the series of distinctions between the Ring-Cosmos and the Ring-Chaos, or (which is the same thing) between evolution and devolution. (These aren’t the words I’d have used, but then I didn’t write our text.) To Fortune, “evolution” means movement toward complexity and integration, and “devolution” means movement toward simplicity and disintegration. These two factors balance each other; they are the yang and yin of the Cosmic Doctrine’s cosmos. It’s helpful to spend some time learning to think about the universe in this way -- to see every existing thing as held in balance between the centripetal force of the Ring-Cosmos and the centrifugal force of the Ring-Chaos, between the pull toward complexity and the pull toward simplicity, between integration and disintegration. That balance has a cyclic component to it, but we’ll be getting into that later in the text. For now, try to think of the world as the interplay of these two forces working at right angles to each other. Fortune calls these forces “Good” and “Evil.” Notice, though, that she immediately undercuts that seemingly straightforward statement by saying that they “are not ‘good’ and ‘evil’ as you understand these terms, but merely spinning circles of force at right angles to each other.” This kind of paradoxical speech is of course immensely common in occult writings, and in the writings of every other branch of spirituality that deals with states of consciousness. She’s also doing a bait-and-switch job here, though that’s only clear from the title of the chapter in the revised edition. We’re talking about negative evil here. Negative evil? That’s evil as inertia, evil as the force that resists the creative movement of the Ring-Cosmos. There’s also positive evil, the actions of individual beings working along the same angle as the Ring-Chaos. This is much closer to the conventional notion of evil, but that’s not discussed in this chapter. Negative evil is far more basic, and so it comes up for discussion first. Here as elsewhere, Fortune is trying to jolt the reader out of habitual ways of thinking -- in this case, the common notion that of course we know exactly what good and evil are, that they’re whatever our cultural (or subcultural, or countercultural) presuppositions inspire us to love and hate respectively, and that we can get rid of evil (or we could, if only those bad people over there stopped being bad people, or simply stopped being). At the time this book was written, such notions were just as fashionable as they are now, and just as counterproductive. At the heart of those fashionable confusions, then as now, is the assumption that good and evil are objective universal qualities of things: in a word, that they’re facts rather than values. Let’s take a moment to unpack that distinction. If I say, “it rained here in East Providence yesterday evening,” that is (or at least purports to be) a statement of fact, and if you were standing on the corner of James and Taunton a stone’s throw from my apartment on the evening in question, you would be able to tell whether it was actually a statement of fact or not. Now let’s imagine that you have a garden and I have a hay meadow next to each other on the outskirts of East Providence on the evening in question. It’s shaping up to be a hot dry summer, and as the clouds begin to spit down rain, you look at your garden and say, “Oh, good, it’s raining.” At the same moment, I look at my hay meadow, knowing that rain will spoil the new mown hay, and say, “Oh, crap, it’s raining.” For you, rain is good; for me, it’s evil. That’s where we cross the boundary between a fact and a value. Where a statement of fact says something about the objective properties of a thing, a statement of value says something about the subjective relationship of an observer to that thing. Good and evil are values, not facts, because something can never simply be good or evil; it must always be good or evil to someone, good or evil for something, and so on. Does that mean that good and evil are whatever you say they are? This is where Fortune’s analysis hits its stride. Good and evil, in her metaphor, are always relative to a cosmos; good is the plane in which the Ring-Cosmos forms, and evil is the plane in which the Ring-Chaos forms. A different cosmos will have its Ring-Cosmos and Ring-Chaos in different planes, and so good and evil may mean something completely different there. Note, though, that from within a given cosmos, the original angles of its rings are absolutes. If you’re part of that cosmos, you can’t change them; all you can do is respond to them. As we’ll see, furthermore, everything is a cosmos. Your garden and my hay meadow are cosmoi -- yes, that’s the plural of cosmos -- with their Rings at different angles, so that rain that evening is at the angle of your garden’s Ring-Cosmos and my hay meadow’s Ring-Chaos. Everything that exists has its own Ring-Cosmos, Ring-Chaos, and Ring-Pass-Not: put another way, everything that exists is in a state of equilibrium between a set of forces that tend to sustain it and a set of forces that tend to dissolve it. At every scale of being, the same pattern repeats. This is one of many places where The Cosmic Doctrine does a remarkable job of anticipating a body of knowledge that didn’t really come into being until after Dion Fortune’s death. Systems theory was a product of the decades following the Second World War; it was newborn when The Cosmic Doctrinewas first privately published in 1949, and didn’t exist when Fortune penned the original manuscript in 1923 and 1924 -- and yet many of the core concepts in our text are also core concepts of systems theory. Did Fortune read some of the first tentative writings that laid the foundations of systems theory, such as Jan Smuts’ Holism and Evolution? Or was Charles Fort right to argue that human creativity is subject to something like seasonal cycles, so that ideas crop up in various minds when it’s time for them to appear? It’s an interesting question. One way or another, we can make good sense of Fortune’s discussion of good and evil if we take the word “cosmos” and replace it with the word “system.” What is a system? There are various definitions in systems theory, but the most useful here is that a system is a set of self-sustaining interactions among a definable group of things. Quite a bit of systems theory talks about the way that systems find an equilbrium between anabolic processes (those that move toward complexity and integration, i.e., the Ring-Cosmos) and catabolic processes (those that move toward simplicity and disintegration, i.e., the Ring-Chaos), but I want to focus on a different point here. Systems unite into greater systems and subdivide into smaller systems. From the viewpoint of systems theory, you are a system; you are made up of systems (your nervous system, your digestive system, etc.) which are made up of systems called tissues, which are made up of systems called cells, and so on. Going the other direction, you are part of a system called a community, which is part of a system called a nation, which is part of a system called humanity, and so on. Each of those systems, in Fortune’s terms, is a cosmos with its own set of rings. So those labels “good” and “evil” can be applied to a great many rings going at a great many angles. You are part of some of those systems, and how much influence you have over them varies dramatically from case to case. Some of those systems, of course, are also part of you, and your digestive system (for example) may well have its own ideas about what is good and what is evil! Then there are other systems that are distinct from you, and exist independently in one of the larger systems to which you already belong. Each of these are cosmoi. Each has its own good and evil, just as you have, and your interactions with all of these nested systems defines your life. Good and evil in the usual moral sense of the words are simply the Ring-Cosmos and Ring-Chaos of the culture (or subculture, or counterculture) in which you happen to have been born, or in which you now live. Notice how this works: if you do the things your culture (etc.) considers good, you will end up more deeply integrated into it; if you do the things your culture (etc.) considers evil, you will probably end up either removing yourself from it or being removed from it -- in either case, you’re following the Ring-Chaos, which is a suction toward outer space. If you’ve had the experience of leaving one subculture and ending up in another, as so many people do these days, you know what it’s like to drift quickly or slowly out of line with the rest of the subculture, to spiral out to the edge of the Ring-Pass-Not, and then one day to find that you’re on the outside looking in and nothing inside really makes sense to you anymore. Take Fortune’s metaphors and apply them to that experience, and the abstract structure of Rings and angles may be a little less abstract thereafter. Let’s move on. In the last page and a half or so of the chapter we’re studying, Fortune takes her analysis of evil and builds on it in a way that many people find counterintuitive, even threatening. She suggests that there are basically two ways of dealing with negative evil: you can oppose it in order to lock it into place and make it permanent, and then do something with that; or you can draw back from it in order to let it follow its natural trajectory to the Ring-Pass-Not, where it will dissolve back into raw substance and go away. We don’t think like this in modern Western cultures. Our basic assumption is that if you want any kind of evil to go away, you fight it and destroy it, and if you want it to stick around, you back away from it and let it follow its trajectory. That’s deeply ingrained into our thinking, and probably explains why we’re so bad at dealing with evil. Evil in the terms we’re using, remember, doesn’t mean whatever you happen to hate. Negative evil, which is what we’re discussing, is the circle of force at right angles to the current of evolution, the suction toward dissolution and the Void. There are certainly things you and I don’t like that can’t be met with the strategies Fortune offers, but then they’re not what she’s talking about when she speaks of negative evil. Now in principle you can do the same two things Fortune describes when you have to deal with positive evil, i.e., with persons or forces within a cosmos that are moving in harmony with the Ring-Chaos of that cosmos. You can use them as a thrust block, something to push against so that you have traction for something you want to do. Alternatively, you can evade them, and let them follow their own trajectory right out to the void. Both of those work, though they work in different ways. Both of them also require skill and a good sense of timing. Interestingly, this is something that martial artists know. If you’re a competent martial artist and somebody throws a punch at you, broadly speaking, you can do one of two things. You can block the punch, and use that moment of hard contact between your bodies as a basis for your own response. Alternatively, you can evade the punch so that the other guy wastes his energy in empty air. Different martial arts (and different martial artists) specialize in one or the other of these, and take it in various directions; a karateka, say, may use a block so forceful it damages the other guy’s arm and then kick him in the face while the pain has him off balance; an aikidoka may slip neatly out of the way of the punch and then add a graceful push at exactly the wrong moment, so that the other guy loses his balance and meets the ground face first. Either way, though, the principle is there. Either way, too, you’re using evil for your own purposes. That doesn’t mean that you move in harmony with it, in the plane of the Ring-Chaos; that’s what Fortune has in mind when she warns about working dynamically with evil. Instead you use evil as a static presence, either to propel yourself along the track of the Ring-Cosmos, or to take something out of existence for you. That’s one of the secrets of the initiates: since negative evil is always present, you might as well do things with it, and this is how you do things with it without getting caught up in it. It helps, by the way, if you make sure that you’re actually moving in the same plane as the Ring-Cosmos of your system. Few things are so common in human life as a person or a group of people who are so sure they’re on the side of the angels that they never bother to check, and it’s quite possible for two parties in bitterest contention with each other -- at right angles to each other, in Fortune’s symbolism -- to be equally far from the Ring-Cosmos. That’s common in situations when a conflict remains stuck in place for a long time; since they’re equally balanced between the two primary Rings, neither side wins and neither side dissolves. Their opposition remains as solid as concrete. You oppose something when you want to lock it into place in order to build on it; as some schools of psychology like to point out, “what you resist, persists.” You evade something when you want to send it spinning out past your Ring-Pass-Not. Choose carefully which of these you want to do, because the results will not be the same. Questions and comments can also be posted here for discussion. (I’d like to ask that only questions and comments relevant to The Cosmic Doctrine be posted here, to help keep things on topic.) We’ll go on to the next piece of the text on August 8. Until then, have at it! In unrelated news, Zendexor, my coeditor for the Vintage Worlds anthology, is looking for stories set in the Old Solar System for an online magazine, “Tales to Astound,” on his Solar System Heritage website. This isn’t a paying gig, but it’s a good way to get your work sympathetic and thoughtful attention from readers. If you’d like to submit a story or three, read the website first – rule #1 for a writer: always make sure you know your market! -- and then submit your stories to heritageofdreams (at) aol (dot) com.